Attorney General Andy Beshear and several Democratic lawmakers are supporting legislative reforms to ensure Kentucky can halt its opioid epidemic, and place families and communities on a path to prosperity. Beshear’s top priority for the 2019 legislative session is to gather bipartisan support for House Bill 44. The measure would require opioid lawsuit settlement dollars and fines recovered by the Office of the Attorney General to go into a permanent fund to support drug prevention educators, law enforcement and treatment providers. Rep. Dennis Keene, D-Wilder, is sponsoring HB 44. Beshear, a candidate for the Democratic nomination for Governor, also supports several other bills sponsored by legislators from the party. Beshear is working with Rep. Chris Harris, D-Forest Hills, on a bill focused on cracking down on “rogue” opioid recovery centers that allow patients to obtain and misuse drugs intended for treatment. Harris said many parts of the Commonwealth, specifically in Eastern and Southeastern Kentucky, have witnessed a rise in the abuse of the treatment drugs, suboxone and methadone, right alongside the abuse of heroin and fentanyl. In addition to grappling with the opioid epidemic, Beshear said Kentuckians are also hampered by increasing utility rates that often force families to choose between utilities or groceries. Harris and Rep. Angie Hatton, D-Whitesburg, are working with Beshear to strengthen protections for utility customers before a state regulatory agency. The legislation would give the Public Service Commission (PSC) broader authority to hold utilities more accountable when considering potential bill increases for Kentuckians by allowing the regulatory agency to consider whether proposed or current rates are affordable for residential customers. In the last three years, Beshear has opposed dozens of utility bill hikes, and has helped save Kentucky businesses and families nearly $1.2 billion. Shielding Kentuckians, especially children, from sexual abuse is one of the core missions of Beshear’s office. This legislative session, Beshear is working with Rep. Ruth Ann Palumbo, D-Lexington, to sponsor legislation that requires Commercial Driver’s License or CDL license holders to complete human trafficking training. Since taking office, Beshear has worked to turn the AG’s office into the leading state agency fighting human trafficking. The office has 32 active cases, and just last year secured a record 39 human trafficking and other related offense arrests. Palumbo said her legislative initiative is one that would increase human trafficking awareness exponentially. She said all lawmakers and Kentuckians need to do is hear the story of Nicholasville truck driver Arian Taylor and his 2018 heroic rescue. 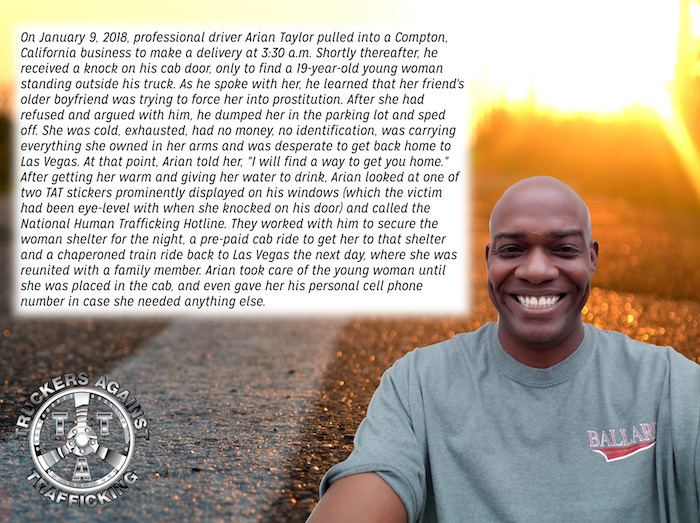 While in California making a delivery in January 2018, at 3:30 a.m., Taylor, who voluntarily took human trafficking awareness training, rescued a 19-year-old woman who knocked on his cab door for help instead of allowing herself to be forced into prostitution by her friend’s boyfriend. Taylor was able to call the National Human Trafficking Hotline displayed on a window sticker of his truck cab to get the young woman help, Rep. Palumbo said. “We must use the example of Mr. Taylor and have all Kentucky drivers as invaluable resources to help protect victims of human trafficking in the Commonwealth and across the country,” Palumbo said. Beshear is working with Rep. Jeff Donohue, D-Fairdale, on House Bill 65 to strengthen Kentucky’s fight in cases involving crimes and victims in multiple counties throughout the state by allowing the AG’s office to petition the Kentucky Supreme Court for a special grand jury. “Consolidating the investigation and prosecution of widespread criminal activity will help us to seek justice for victims and help us build a safer Commonwealth,” Donohue said. As part of the 2019 legislative session, Beshear is calling on state lawmakers to boost the pension system this session by creating a dedicated source of revenue – expanding gaming. He said this includes casino, fantasy sports and sports gaming, as well as preparing for the eventual legalization of online poker.